Professional phone plug according B-Gauge standard BPO316. 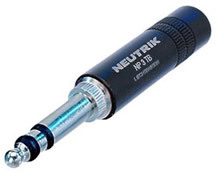 Featuring similar construction as the standard Neutrik phone plugs with chuck type strain relief and slimline metal barrel. These plugs are not compatible with standard 1/4" jacks (acc. EIA RS453) and patch panels.